The goal of my research is to understand the interplay between people's view of themselves and their social beliefs. In the area of self perception, I have been particularly interested in egocentric biases, such as social projection and self-enhancement. In the area of social perception, my interests have been focused on social categorization and stereotyping. Rather than studying these topics in isolation, my research strategy is to try to understand the linkages among them. Alicke, M. D., Dunning, D., & Krueger, J. I. (Eds.). (2005). 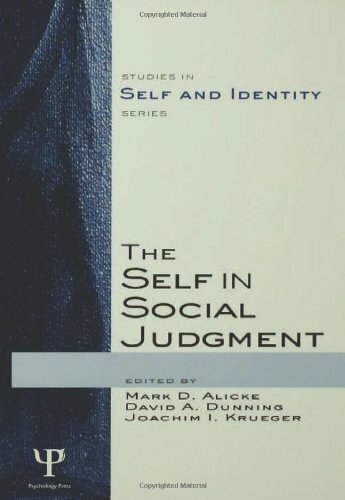 The self in social judgment. New York: Psychology Press. Krueger, J. I. (Ed.). (2008). 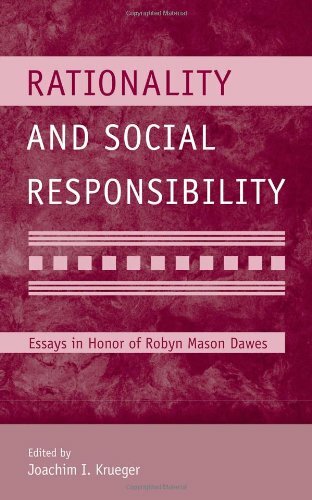 Rationality and social responsibility: Essays in honor of Robyn Mason Dawes. Mahwah, NJ: Lawrence Erlbaum Associates. Clement, R. W., & Krueger, J. (2002). Social categorization moderates social projection. Journal of Experimental Social Psychology, 38, 219-231. Kaplan, A., & Krueger, J. (1999). Compliance after threat: Self-affirmation or self-presentation? Current Research in Social Psychology, 4, 178-197. Krueger, J. (2001). Null hypothesis significance testing: On the survival of a flawed method. American Psychologist, 56, 16-26. Krueger, J. (1998). Enhancement bias in descriptions of self and others. Personality and Social Psychology Bulletin, 24, 505-516. Krueger, J. (1998). On the perception of social consensus. Advances in Experimental Social Psychology, 30, 163-240. Krueger, J. (1998). The bet on bias. A foregone conclusion? Psycoloquy, 9(46). Krueger, J., & Clement, R. W. (1997). Consensus estimates by majorities and minorities: The case for social projection. Personality and Social Psychology Review, 1, 299-319. Krueger, J., & Clement, R. W. (1996). Inferring category characteristics from sample characteristics: Inductive reasoning and social projection. Journal of Experimental Psychology: General, 125, 52-68. Krueger, J., Ham, J. J., & Linford, K. M. (1996). Perceptions of behavioral consistency: Are people aware of the actor-observer effect? Psychological Science, 7, 259-264. Krueger, J. I., & Funder, D. C. (2004). Towards a balanced social psychology: Causes, consequences, and cures for the problem-seeking approach to social behavior and cognition. Behavioral and Brain Sciences, 27, 313-327. Krueger, J. I., Hasman, J. F., Acevedo, M., & Villano, P. (2003). Perceptions of trait typicality in gender stereotypes: Examining the role of attribution and categorization processes. Personality and Social Psychology Bulletin, 29, 108-116. Krueger, J., & Mueller, R. A. (2002). Unskilled, unaware, or both? The better-than-average heuristic and statistical regression predict errors in estimates of own performance. Journal of Personality and Social Psychology, 82, 180-188. Sinha, R. R., & Krueger, J. (1998). Idiographic self-evaluation and bias. Journal of Research in Personality, 32, 131-155.